The last time we looked at Japan's giant pension fund, the Government Pension Investment Fund (or GPIF) which is the largest in the world and manages 158.6 trillion yen ($1.43 trillion), we found a problem: according to the latest quarterly release, Japanese equities accounted for 25.14% of the GPIF's portfolio at the end of March (which equates to over 40 trillion yen worth of shares covering roughly 2,300 issues). This is a problem because the GPIF's portfolio has exceeded its 25% allocation target for domestic stocks for the first time, a milestone that - unless the world's largest pension fund changes its strategy for "stable returns" - could have severely adverse consequences for local risk assets, as it would mean one of the "whale" buyers of Japanese equities - the BOJ being the other - would no longer be in the market. But while it would hardly surprise market watchers to see the GPIF once again bend the rules and further stretch the definition of what is considered a "safe" asset for retirees as it seeks to boost returns, some have proposed even more radical "solutions." According to Bloomberg, former Fed senior economist Yoshio Nozawa - who researched corporate bond spreads for the Fed over the past five years - suggested that the world’s largest pension fund should step even further out of its comfort zone and buy more high-yield bonds and alternative assets such as real estate. The reason: the pension fund’s long-term performance of its 158.6 trillion yen ($1.43 trillion) in assets is more important than quarterly results. Speaking in an interview in Tokyo after winning a GPIF award for corporate bond research in July. Nozawa said that "investors that can own assets for a long period have a high risk tolerance," and continued: "pension funds have the advantage of being able to hold low-liquidity products that other investors usually shy away from, so there’s room for them to consider investing in more of those assets." In other words, just because the GPIF has what some would say an infinite investment horizon, it can take virtually unlimited risks with its investments in order to generate higher yields: after all the BOJ is there to make sure it doesn't blow up. Earlier this year, the GPIF's investment guidelines were revised to include the buying of Japanese debt rated below BBB, i.e., junk bonds, "under certain conditions." And, as of the first quarter, it had allocated about 415 billion yen to actively managed foreign high-yield bond funds run by firms such as Nomura Asset Management, MacKay Shields and UBS Asset Management. Apparently it's not enough, especially since "alternative investments" such as junk bonds made up only 0.17% of the GPIF’s total assets, below its self-imposed limit of 5%, as of the end of June. The key to analyzing corporate bonds is understanding the composition of their spread, which is affected by the expected default loss and risk premium, according to Nozawa, who currently teaches finance at the Hong Kong University of Science and Technology. If the risk premium is driving the spread, then it may indicate that it’s time to buy the debt rather than sell, he said. This also applies to stocks and other assets, he added. Or, as another former Fed "researcher" would say, "the risk of massive junk bond defaults is contained." Potential junk bond losses aside - which of course are guaranteed during the next global recession - there may be another problem: not enough junk bonds to buy as issuers tend to cater to a domestic institutional audience the prefers IG bonds. Japanese investors such as pension funds and life insurers tend to invest in investment-grade bonds. According to a report by Nomura Institute of Capital Markets Research, corporate debt issuance was about 11 trillion yen in 2017, with more than 95% of the securities rated A or higher. 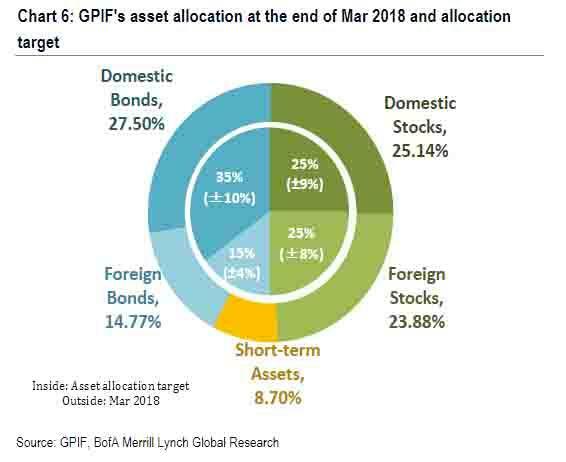 And yet, as Sumitomo Mitsui strategist Ayako Sera said, the GPIF has little choice but to diversify into alternative assets and high-yield bonds if it wants higher returns because Japan’s bonds, which make up about 27% of the GPIF’s assets, have virtually zero returns (well, the may rise as high as 0.2% as per the BOJ's latest announcement) as the Bank of Japan maintains its unprecedented monetary easing.